Musheer Hussain, Edward Fisher, Robin Youngs, Jonathan Fishman,	The Journal of Laryngology & Otology, Volume 131 Issue 5, p 377. M Camacho, M W Noller, S Zaghi, L K Reckley, C Fernandez-Salvador, E Ho, B Dunn, D K Chan,	The Journal of Laryngology & Otology, Volume 131 Issue 5, pp 378-383. E U Sakarya, N Bayar Muluk, E G Sakalar, M Senturk, M Aricigil, S A Bafaqeeh, C Cingi,	The Journal of Laryngology & Otology, Volume 131 Issue 5, pp 384-390. Naragund Amith, Mudhol RS,	The Journal of Laryngology & Otology, Volume 131 Issue 5, pp 391-398. AD Olusesi, O Oyeniran,	The Journal of Laryngology & Otology, Volume 131 Issue 5, pp 399-403. Y Dai, L Lu, J Hou, X Yang, H Li, Y Yang, W She,	The Journal of Laryngology & Otology, Volume 131 Issue 5, pp 404-410. P M Picciotti, G Della Marca, L D'Alatri, D Lucidi, M Rigante, E Scarano,	The Journal of Laryngology & Otology, Volume 131 Issue 5, pp 411-416. L Burrows, T H Lesser, A V Kasbekar, N Roland, M Billing,	The Journal of Laryngology & Otology, Volume 131 Issue 5, pp 417-424. 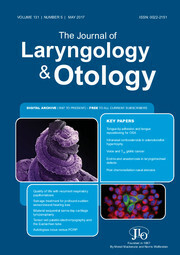 B B Montaño-Velázquez, J Nolasco-Renero, J E Parada-Bañuelos, F Garcia-Vázquez, S Flores-Medina, C S García-Romero, K Jáuregui-Renaud,	The Journal of Laryngology & Otology, Volume 131 Issue 5, pp 425-428. V V Wilmot, I Hathorn,	The Journal of Laryngology & Otology, Volume 131 Issue 5, pp 429-432. J A Song, M H Rigby, J Trites, R D Hart, S M Taylor,	The Journal of Laryngology & Otology, Volume 131 Issue 5, pp 433-441. C Brammer, D Dawson, M Joseph, J Tipper, T Jemmet, L Liew, C Spinou, N Grew, N Pigadas, K Rehman,	The Journal of Laryngology & Otology, Volume 131 Issue 5, pp 442-446. E D Gozen, M Yener, Z B Erdur, E Karaman,	The Journal of Laryngology & Otology, Volume 131 Issue 5, pp 447-454. J Sotirović, A Perić, D Vojvodić, N Baletić, I Zaletel, I Stanojević, M Erdoglija, M Milojević,	The Journal of Laryngology & Otology, Volume 131 Issue 5, pp 455-461. S Fang, A Habeeb, P Gluckman, R Kanegoankar,	The Journal of Laryngology & Otology, Volume 131 Issue 5, pp 462-464. C Stephen, A G Lowrie,	The Journal of Laryngology & Otology, Volume 131 Issue 5, pp 465-467.